A Junior Design Awards win is a mark of quality, excellence and ingenuity! Bianca Makris Kids Jewelry and Accessories brand (www.biancamakris.com) received the SILVER Award for the Jewelry and Accessories category of this internationally recognized competition of the Kids Industry. The debut collection of Bianca Makris Kids is inspired from the main BIANCA MAKRIS Women collection, as a stylish option for little princesses. Using high quality European made materials, our handmade jewelries and accessories can change any child’s outfit, making it unique and very chic. The collection includes handmade crochet on chain necklaces, wooden beads necklaces with signature crochet pompom, fine lace headbands and silk taffeta headpieces. 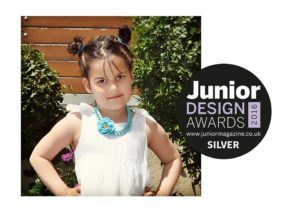 The Junior Design Awards are the original family lifestyle awards that celebrate the labels that create everything beautiful, and yet still practical, and immaculately designed, in a child’s life. From gorgeous fashion to classic toys and books, beautiful interiors and state-of-the-art equipment, luxury family hotels, family tour operators and brilliant family holidays. The annual Junior Design Awards give entrants a unique opportunity to win a prestigious luxury family lifestyle award for the brand and/or products they enter. For 2016, there was a selection of 55 categories to enter, over five sections: Toys, Fashion, Food & Dining, Family travel and Children’s books. We also hosted nine reader-voted categories, for the first year ever, which saw you voting for your favourite brands in your thousands. This year’s brilliant panel included singer Rachel Stevens, TV weather presenter, meteorologist and Junior columnist Kirsty McCabe, designer and Junior columnist Olivia Rubin, journalist Alison Perry of notanothermummyblog.com, blogger Susie Verrill of My Milo and Me, Dan Stockley and Zoe Goldsmith of fashion brand Hucklebones, blogger Eimear Varian Barry, Consumer editor Alison Alexander, and Junior’s content editor, Catherine Hudson. Amongst winning brands : Jacadi, Rachel Riley, Oliver Baby and Kids, River Island by Julia Restoin Roitfeld , BabyK by MyleeneKlass for Mothercare, Oaksofacorn and many more. Posted in Awards and tagged awarded brand, awarded kids brand, biancamakriskids, junior design awards, kids accessories, kids jewelry.